I was cleaning the kitchen and listening to NPR (my default state) when A.J. Jacobs came on, discussing the various diets he'd committed to for Drop Dead Healthy, his latest stunt journalism book — this guy practically invented the genre. Naturally, most of the diets were a bust, but he did conclude that exercise was always a smart way to keep slim. “I literally run errands! So, I'll run to the drugstore, buy toothpaste and then run home,” he told Scott Simon. I shouted at him, something like, “You stole my line!” But he couldn't hear me. I, too, run my errands. With three young children at home and a husband in the military — he's been away more than he's been home in the past three years — I have to combine everything. So I run to the bank and I run to the bookstore and I run to buy coffee beans and I run to drop off film at the photo lab. Whenever my parents drop by or a friend tells me he'll watch the boys for a bit, or now that my oldest is responsible enough to watch his brothers for 25 or 30 minutes while I run somewhere, I'm off, putting as many different to-dos into one small bit of time. I'd just be proud of myself for saving time and multi-tasking, but as I've learned, it saves money, too. Running somewhere with a specific need in mind — take Sunday, when I ran to get cash and coffee beans — really limits my extraneous shopping. Cash fits in any pocket and I can carry one small-but-bulky item in my running vest pocket. So when I happened to stop by the bookstore to check out the 30% off local presses sale they were having, I found a great deal on a book I want. But run 1.75 miles with a book and a bag of coffee beans? Awkward and I couldn't really afford it. I left the book on the shelf. I'm one of those people who needs a lot of reminders not to overspend, and because I know I'm like that, I appreciate the self-imposed restrictions. You can get this restriction a number of ways, of course — many of our readers carry only cash that they have budgeted for the shopping trip, day, or spending category. But I particularly like the run-your-errands strategy, because it includes some side benefits that may also lower my expenses too (now and in the future): I don't have to pay for a gym, and we all know that exercise can decrease potential future health issues. Another thing running my errands does for me is keeps me from what I call “associated spending.” You probably know what this is even if I made up the term: for me, it's stopping when I'm out for a cappuccino or a quick lunch. I do it often when I'm with one of my children, especially if we're bundling errands together. We're in the bookstore, and there's the coffee shop next door! We're hungry already and we didn't bring snacks. Oh, and let's buy a little toy because it's so adorable and I really don't want to get in this argument right now. Mom! Did you realize the grocery store is only two blocks away from the used game store? If I'm running and hurrying back to my kids — either because I don't want to leave the oldest in charge for all that long, or because my friends and family only have so much patience — there's no way I'll stop for a cappuccino or give in to the now-nonexistent wheedling. If you're not up for running your errands, you could achieve this by setting yourself a time limit or going on your lunch break, when you have to be back at a specific time and won't be able to dawdle. With my husband away, I have to pay if I want to leave the house at night. (I've learned after too many very bad choices made by my well-meaning relatives that free babysitting is never free. I'll be paying in counseling and nighttime terrors for that R-rated movie Aunt E. let my kid watch for years.) I've figured it out down to the minute: for most of my fantastic and well-worth-it babysitters, it's $1 for every five minutes. This means my nights out on the town are few and far between. I go to a writer's group once a week, and bring chocolate ($5) and very occasionally a bottle of wine ($8-10). As my babysitting is so expensive and I don't like to leave my kids too frequently, I rarely go out for dinner or drinks with friends — maybe once a month or less. While I'd of course love to have the going out experience more often, the practicality is too dear and I see this as a blessing: it's so easy to spend $50 or more without thinking much of it at a nice restaurant or wine bar. Instead, I meet friends with kids at parks or coffee shops or at each others' houses, where it's a lot harder to realize that you've ordered $30 in drinks and you still have to leave a tip. For couples, this can represent itself as enjoying “nights in” rather than going out for date nights; putting the kids to bed early if they're young, or letting them stay up late watching a (parent-approved!) movie if they're older, and having alone time in another part of the house without having to leave a tip. There's something about that psychological jolt of having to hand a teenager $40 or $50 that can help keep us from swiping the credit card at at brew pub. Restrict yourself — it's freeing! Ride a bike or take the bus, or use the smallest family vehicle, for errands. I have a cargo bike that can load so this wouldn't work much for me. But if you can't carry a lot home, you'll buy less. It's a pretty simple and elegant restriction. Try it next time you go to IKEA! Commit to only going out to restaurants in your local entertainment book. The “Chinook Book” is a local entertainment-style book that is in several Western U.S. cities now; and I feel confident the restaurants with coupons in the book are good choices. But keeping myself to those restaurants (and those with coupons I haven't used) would be a great way to limit my spending. Make a family “in” night tradition. We have an absolutely sacred Friday Family Movie (and Pizza) Night. My kids have been asking for other traditions, too, like game night. As long as you're not ordering expensive to-go food (we only order pizza once a month or so, making it from scratch or doing the frozen Trader Joe's variety other weeks), it's a great way to be together and to enjoy yourselves without contributing to the family credit card balance. Set family goals. If you have kids, they may not get excited about financial goals — or maybe they will — but either way, you can exploit it for savings. Maybe you'll work to identify two dozen bird varieties in your local parks (you'd be amazed at how easy that is!). Maybe you'll try to run a 5k together, and spend your free time training. Maybe you can learn a language together (enough to go on a family vacation with all the money you save). Maybe you just want to save up enough for a big birthday party. Creating a family goal is a good way to share your restrictions and have something to fill your time in a positive way so you won't spend money. Do you need restrictions like these to save money, or are you a spending Jedi able to control yourself with no effort at all? Have you tried any of the tips above or others I haven't mentioned? There are 51 reader responses to "I Run My Errands, Too! (And Other Ways to Spend Less)". After months of not going out much, the other night I went out to a chain restaurant and was shocked by the condition of the restroom. I mean so shocked I had to back out and compose myself before trying another stall. And this was supposed to be an upscale place everyone’s been saying I should go to. Ugh. And the food was way too salty. You save more than just money by restricting your going out. You never really know what you’re getting on a restaurant plate. I think if you want to turn yourself off to eating out, work in a restaurant for a while and see firsthand what goes on! A well-known chef, in our area, was working in his open kitchen when I witnessed him licking his fingers while preparing food. This is an upscale, expensive restaurant and I was shocked at his sloppy, unhygeinic behavior and felt bad because we were paying for the meal to which we had brought guests. I worked in a restaurant for five years and never saw anything unprofessional. The owner/head chef held everyone to the highest standards. I believe that this is very common in the industry despite what people always claim. I actually *have* worked in a restaurant — several of them, and a few times in the kitchen. As with anything, some are wonderful and others are not. Some employees are fantastic and some are underpaid and in terrible moods. I certainly don’t choose not to go out because of health reasons or concern about the hygiene of the restaurant employees. When I do go out, I pick small restaurants known for their passionate and loving staff, often people who I know or who know friends of mine. But one thing I have decided is to avoid large chain restaurants, where you’re paying for marketing, corporate overhead, and real estate and not much at all for the actual food. give me a place with a $1000 marketing budget and a chef/business manager/decorator any day! I worked at 3 restaurants over the years and never saw anything gross. Olive Garden treats its employees like crap, but that’s another story. The other 2 (local, independent) restaurants are still among my favorite places to eat to this day. I don’t run in the literal sense, but I run errands very quickly and efficiently – mainly for items needed in our businesses. At the same time, I pick up stuff that we use personally and that is on my list. Boy, do I save $ since I have lots of stops and no time to linger while shopping. I write everything that I need to do on my list before I go, it’s all in sequence so I use a direct route (saving gas)and everything needed to be done or purchased is spelled out. Leisurely shopping trips are something I seldom indulge in and even then they are for buying specific things. Running your errands ~ what a great idea! By the sounds of it, you are doing a fine job of showing your kids the way to live a nice life without buying tons of unnecessary stuff and that is one lesson that I wish I had learned when my kids were younger. I am seeing that my kids are showing signs of repeating the mistakes that I made when they were young and impressionable and it is painful to watch. Staying out of restaurants is one way in which we watch our $$$ today. We are not impressed with the scaled down but still expensive menus and the food, IMO, is full of fat, salt and sugar. I just can’t see spending in excess of $100 just to eat at an overpriced corporate chain. Our health has improved tremendously as a result of not eating outside of our own kitchen. Boy, can I relate to leaving the kids home when I go shopping! Bringing the kids definitely costs me money. My biggest tip was stated above by Quest – I severely limit my trips into stores. Once a week I will go to BJ’s or Costco and in that weekly trip, I’ll do all the weekly grocery shopping. Beyond that, I go once a month to Walmart and stock up on the same four food items that are staples in our home. Walmart has the cheapest everyday prices on items I always have in the house like very specific flavors of yogurt and Tombstone pizza. If I scoured the weekly supermarket circulars, I could probably find comparable or better deals on some of those non-warehouse staples, but I have found if I start reading those ads, I’ll find other great deals and I end up spending more. Better I spend a little extra sometimes at one store than start picking up unneeded great deals at the supermarkets. We need to consider the true cost of what we are buying. Shopping local, when practical, keeps the $$ in my town, and those stores tend to pay a living wage. I rarely see support of local merchants here. This needs to be part of the consideration when choosing a store. I find that using the local small businesses, I spend less, get what I need and manage to take care of it quicker. I spend less, because I get help to find what I want and do not spend the time searching for what I need and buying what I did not come in for. If you take the circulars into Walmart, they will match the prices. I was discussing the longterm costs of only being able to purchase what Walmart chooses to offer when the Home Town Stores that actually know what customer service are shut down. Sometimes I will bring my credit card and grocery list with me when I go for a run, and then pick up stuff after I finish, on my way home. You can’t buy too much that way – I’m limited to what I can carry the 3-4 blocks home. For the most part, I am able to stick to the essentials when I do that. Also helps that the grocery store is 24hrs, so it works even when I do an early morning run. I think this strategy has fitness benefits, too. If you are used to only exercising at a certain time wearing certain clothing, your body gets used to that. If you sometimes go for a short run in less-sporty cothing on a Tuesday afternoon, your body doesn’t know when you might exercise next, and it stays primed for exertion. In my experience, that translates into positive changes in appetite, activity/fidget level, and general alertness. It’s the biggest thing I miss about living in a walkable/bikeable environment – feeling ready for anything much of the time. Too me saving money is all about my time value of money. If it will cost me less to outsource something then to do it myself, then I am going to chose that decision every single time. I use self-imposed restrictions as well. I will only use my reusable totes for shopping. No brown bags or store bags, etc. If a friend wants company while indulging in retail therapy, I will join but I will not bring my totes. This way, I won’t buy anything unless I can fit it in my hands – so I may splurge on a coffee. If I do happen to find an item I like, then I will go back with my tote and purchase it. Usually, by time I go home, get the tote and find the energy to go to the store, I realize I didn’t really want it. I guess I have a few “tricks”. Just leaving the credit card at home keeps me from buying online during the day. I keep things in my online shopping basket at amazon for months. As time goes on, I find that the price has been lowered, I found the item or something else that will work as well at the thrift store, or my kid is no longer into xyz so no need to buy that now for a present. Then a few times a year, I’ll buy the few things still in there with discounted gift cards. People still use film? I would imagine that switching to digital might be a way to cut down on some expenses. I am a big one for only paying for things in cash. When I’ve used credit cards for grocery store purchases or shopping trips to Target, I find myself buying stuff I don’t really need “just because.” Even though I pay the bill in full every month, I’ve found that I was spending at least $50/month in extras – dessert, a bottle of wine, DVDs – that I didn’t really need. Now that I pay in cash, I have to think long and hard about impulses and staying under budget. So, yes, I loved this post, and I just wish I had more stores near my house that I could literally run to. Good work! You appreciate it more when you have to work for it. This is a very timely piece for me. I made a brief foray into a local bookstore for a new much needed new Moleskin. Store was located right next to the Pet Food Store I was picking up at. Two birds and all that. Yet, somehow I came out of there with $45 in books. WTF?! This also reminds me of JD’s ill fated grocery shopping trip not to long ago. Off-topic, but curious – what is the going rate for a babysitter? Kaytee, here in Portland, Oregon I pay $12 for three very energetic and charming and difficult boys. When I use a teenager or someone I’m not expecting to have to do something difficult — feed them or put them to bed — or some friends who give me a “buddy” rate, I pay $10. according to my high school-age cross country runners, some teenagers charge $6 for the first child and $2 for every child thereafter. They give discounts on full-time care (when they work during the summer or school breaks). and from what I’ve heard from parents across the country, this is pretty standard; slightly higher in the biggest cities and slightly lower in smaller towns. It depends on where you live. My 18 year old daughter gets $15 an hour in the Boston area. Plus her “clients” usually round up to the closest hour. It is a great source of revenue in an economy where part-time jobs that used to be done by teenagers are now going to adults who are forced to take employment that they are way over-qualified for. I am far too sweaty to be able to run and accomplish anything else. But I am usually on a tight enough schedule that I can’t lolly gag, so it keeps me from the window shopping that results in literal shopping. A lot of recent articles have me wondering if I am superhuman – I just don’t need to do all sorts of weird things to trick myself into not doing bad stuff. I always thought I was fairly normal and boring. This was a great article – I would like to try biking my errands – my neighborhood isn’t quite as walkable. Down side is that the bikable grocery store is more expensive than the drivable one. This was such a cool and creative article! I’m not sure if I can run my errands but I’m going to start using my bike for my errands a little more. I do my own version of this. We only have one car which my husband takes to work. I need to run errands on foot. Once I pack the stroller with both kids, cloth diapers, water bottles, burp rags and everything else, there is so little room left that I am pretty restricted on what I can buy at the store. Pushing that double stroller uphill wearing a backpack full of groceries is a workout! Hi Sarah, a question for you. Do you have savings goals as a percentage of your income, or do you just try to maximize savings to wherever they’ll reach? I ask because I’ve recently embraced Elizabeth Warren’s Balanced Money Formula, and this means that as long as I’m covering my needs and saving 20% of my income I get to do as I please with the rest, and I’m loving it. This is the first year I’m able to afford this system of course, cuz before I barely had enough to cover my needs, I had crazy debts and my wants went unchecked in spite of this. So I’m really asking you about it to analyze different paradigms as I plan future adjustments. While I’m enjoying the 50/30/20, I’m thinking I’d like to increase the savings percentage in the future, and if you could offer a rationale to do that (since you seem to be doing it) I’d appreciate it. El Nerdo: OK, this is a pretty deep question because it contains lots of assumptions and personal factors, so I can’t really answer it easily. I’ll say first that I’m probably NOT saving more than 20% of my income — right now, my husband (who’s overseas in the Army) is making the vast majority of the income in the family, and we’re saving probably exactly 20% of his income, and none of my quite small income. We made some really bad choices at the beginning of our marriage (like, for instance, having a huge expensive wedding financed by a home equity line of credit) that mean we’re still paying off a lot of old debts. When I’m talking about preventing spending, it’s so I can have more flexibility with my small income and not be pinching pennies at the end of the month and asking my husband, can I have a little more grocery money? :) So: that’s a caveat. Now, your situation. This probably deserves a whole post. The big rationale I can offer to save more than 20% is that you never know whether or not your current income situation is going to last. Whether that’s because of a cynical view of the corporate climate or worries about health problems or the simple randomness thrown at us by the universe — a family member in need of help or a car accident or oil discovered in our back yard — I think it’s wise to consider this possibility and, if your savings are not already very healthy, up the percentage. This is not to say that I belief in frugality for frugality’s sake. I believe that spending can be fun and good and healthy, up to a point; I myself spend more than most people find reasonable on high-quality, locally-produced food and, lest we forget, fair-trade chocolate and coffee, also books and subscriptions to obscure literary journals. I think it’s a situation of finding that balance between sensible protection of your security, an acceptable mitigation of future risk, vs. living life in a way that makes you happy. If you’re spending too much of your effort worrying about future poverty (I don’t think you are, but IF), then you’re going to be miserable, and you should by all means seek to ameliorate this by allowing yourself the permission to spend money! However, if you believe your savings are very small and you can increase them while maintaining an acceptable level of happiness, I would err toward saving more. Ah, many thanks, see, I thought you were saving more than 20%, and going to extremes to do it, but now I realize you’re trying to get there (in a way), so the money-saving schemes make sense. Per Elizabeth Warren’s formula, that 20% includes debt repayment– her method is: a) get a small emergency fund, b) pay off debts, c) build actual savings, like a year’s worth expenses, investments, etc. It’s like the Dave Ramsey sequence except that his percentage of the budget is not limited to 20%– it gobbles up as much as you can make it while temporarily “going crazy”. I think depending on the size of the debt some of us might be able to handle the Warren system and some of us might need to adopt some measure of Ramsey’s “crazy”. (She discusses bankruptcy as a possibility, he says you just shouldn’t do it). But my impression was that you were into extreme frugality, ERE-style, and now I see you’re not. My wife and I don’t have kids and live in a 1br apartment (with the office in the living room), so even with a small income that’s a lot less financial pressure for us and we can (for now) afford the 30% “play money”. Still, who knows about the future. And I really don’t worry much about future poverty– I’m used to it, haa haaa haaa. But yeah, at some point I’d like to make up for years of debts and lost savings. In the past we lived on a feast-famine cycle with an overall negative cash flow, but right now we’re just enjoying having our head above water — “oh look, we have leftover money and it’s the 29th!”– which is still a shock. Thanks for the answers, they let me put your article into perspective and understand your thinking, and I can see how to apply these ideas to my situation. I enjoyed using the balanced money formula but when we made $60k/year I saved/debt repaid 30% comfortably. When our income went down it seemed too difficult to save 20% even though we now have only a mortgage as debt. @ Amanda – what Warren’s book says for that is that if your income goes down you have to correspondingly reduce your needs (i.e. your essential financial commitments) so you can continue to a) save, b) have fun. I’m lucky that as a renter I was able to move from a 3 bedroom house to a 1 br apartment with a simple 30-day notice. However, not everyone can do that. The money balance book tells the story of a woman who got divorced and was stuck with a mortgage she couldn’t afford, and had a daughter in a good school district she didn’t want to leave (I seem to recall a year or so ahead of graduation)– so instead of selling her house she teamed up with another single mom in a similar situation; the other lady moved in with her own daughter, which helped cover the mortgage and household expenses, and they also became good friends. Bottom line though was that through creative means she reduced her needs budget without actually losing her house and without a traumatic relocation for her daughter. El Nerdo: I’ve heard of that formula, haven’t read the book. When calculating the 20%, does that include what you put into your retirement fund? (In my case, a 401(K). If I lived downtown somewhere with the option of walking places I’d certainly try it. Exercise plus getting things done, great! Re: the no shopping temptation….this works for me when I am on my long exploring backpacking trips. Knowing that anything I buy I have to carry on my back stops me from buying the wonderful souvenirs that are so tempting everywhere. If I buy something it is something very light like earings and I wait to the last day of the trip to buy any gifts I am taking home for family. I do a similar thing, only I walk my dog to the store and only buy what I can carry home in a bag with one hand. Other hand is used for controlling a five month old pit bull puppy. He gets his walk in, I get a mini work out and save money. Not sure if it is very practical for family’s but it works well for us. I am impressed you only need one hand to handle a pitbull puppy! They are so cute but one of the strongest dogs I have ever encountered. You will have a life time of joy and extremely buff arms. This has nothing to do with the original writer but I think I’m getting tired of personal finance. This website has helped me a lot especially by getting out of debt but I actually think the articles here are getting a bit repetitive. As a subject PF has an expiration date. 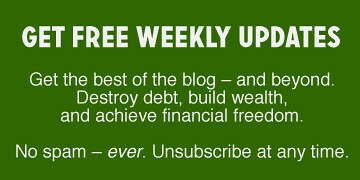 Whether its PF blogs or finance magazines like Money and Fortune. Everything seems to get repetitive over time. I’ve lost interest in the PF topic. Thanks for being there when I needed help. However its time to move on. I wish you the best GRS. IMHO the expiration date has to do with your personal financial journey. When just starting to get out of debt and learn good financial habits PF writers provided a lot of my motivation. Now I read them looking for a small tip here or there I may find, not expecting much. As your situation changes your perspective changes! I think you’ve got a great strategy. My only caution is about exercise–don’t forget strength training. You don’t need a gym to do that (use bodyweight exercises, find resistance bands at a thrift store, lift large cans, etc. ), but be sure and do it. I live within walking distance of my small town’s downtown. I can walk to the pharmacy, library, several shops etc. I try to walk over to get my prescriptions filled or whenever I need something I can get at the pharmacy. And I try to walk to the library, it’s about 4 blocks from my apartment and sometimes, even though I’m walking, I end up with four or five hard backs. I’m training for a new job and there’s no parking on site, the parking is about 1/2 mile away and there’s a shuttle. I’m trying to walk to and from the job. When the training is over I’m going to a different location (with off site parking) and I’m not sure how far it is from parking to the building, but I was told the walk TO the building is all up hill (and i’m really out of shape). So I’m going to at least try to walk down to my car a few times a week. I started reading this and thought “wow, what a good idea, but I hate running!”. Then I read the rest and realised this is *exactly* what I do. Except I have a bike. So I can only take what I can fit into my carrying-things (pockets, backpack or panniers, depending on how big a shop I’m planning). Otherwise I have to walk home pushing the bike, which is not an option I’m prepared to contemplate. I’ve found that ordering groceries online also helps, as my list only ever includes stuff that I *need*, not the stuff I pass on the shelf and go “oooh, shiny”. Yes, I have to pay delivery, but given I don’t have a car, and I use it to buy things that are impractical to transport on a bike, like big packs of pasta, rice, and TP, I’d be paying that anyway (either to buy the big packs, or in the extra cost of the multiple smaller ones). Loved this article. I’m a 45 year old mom to a10 year old boy and exercise is a must at my age. I made the decision about a month ago to start riding my bike and or walking for errands as often as I can. I’m getting better from week to week. My biggest challenge is time; it is so much easier just to jump into my car. I have a fitbit which tracks my steps and that helps incourage me to find excuses to walk. Thanks for the article, loved it. I have a pretty walkable neighboorhood with a score of 65. Within 1 mile I have almost everything I would need to get to, bank, post office, multiple groceries, thrift stores, Starbucks. I’m hoping I can park my car more this fall when both girls are in school full time. As it is, I did get my 6 year old to walk the mile to the Dollar tree the other day when she reminded me we needed tape. She didn’t complain once, probably because she really wanted the tape. I also plan on buying a cruiser bike with a basket so I can do more shopping at the grocery store when I don’t want to drive all the way to the commissary. I think by the time I factor in gasoline, wear and tear and time driven the costs are pretty much similar.